One of the most important rooms in your home is the bathroom. According to statistics, the average person will spend a year and a half of their entire life in the bathroom. This is not something to take lightly. Bathrooms also have a large impact on the resale value of your home. When you look for the best home builders in Greensboro, check out the photos of bathrooms they’ve done and be sure you like what you see. Be ready to share your own ideas for your dream bathroom. Need a little help deciding what you want for your bathroom? Consider these tips. Your bathroom should be beautiful, but more importantly, it should be functional. The space, layout, and features of your bathroom should be based on how you use your bathroom on a daily basis. It needs to be a space where you can get ready for work in the morning and also a place you can take a relaxing shower or bath (if you are a bath person) at the end of a long day. Carefully consider the placement of the tub, shower, sinks, toilet, storage space, and any other feature you plan to include. Some find it helpful to have a separate space with a door to house the toilet, leaving the rest of the bathroom separate. In some cases, the toilet and shower are in the same room and the vanity space is separate to allow one person to get ready without the steam and heat from the shower. A separate garden tub is a luxury, but may not be necessary for everyone, especially if no one really takes baths. Pedestal sinks are stylish but don’t offer storage. Plan around your everyday life. It’s worth it to put in the finer details that you picture when you imagine your dream bathroom. Go for the tile floor and walls that give you the style you want. Put in the steam shower and heated towel bar that makes your bathroom that much more luxurious. This is your dream bathroom after all. Additional radiant heating, so you step out of the shower to a warm floor, is also a valuable upgrade. Plan for different lighting options; you’ll need bright light for applying makeup, but may want dimmer light for a relaxing ambience while taking a bath. Make the bathroom a worthy part of your dream home. 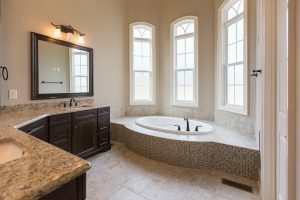 If you truly want to have the bathroom of your dreams with every feature and detail, you need one of the best home builders in Greensboro, R&K Custom Homes. An award-winning builder in the Triad, R&K has built and continues to build luxurious custom homes in popular neighborhoods in Greensboro and northern Guilford County. View the gallery of bathrooms already gracing the homes of satisfied customers. Bring your ideas and dreams and call (336) 643-3503 to start designing your dream home with R&K Custom Homes.